Why is it that candy is considered so bad for your teeth? Let’s take a look. Why is it that candy is considered so bad for your teeth? 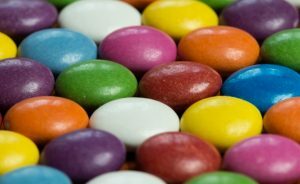 We’ve all heard that candy will rot your teeth, but what exactly does that mean, and how does it happen? Let’s take a look. You see, your mouth contains naturally occurring bacteria. That bacteria loves to feed on sugar, and once it does, it breaks it down into acids that slowly eat away your tooth enamel. Now, the outer part of your teeth, or the parts that we can see, are usually okay since the acids are washed away when you produce saliva or drink water or brush your teeth. So essentially in those spots the sugar, which is the bacteria’s food, is washed away. The trouble occurs in the hard to reach areas, the nooks and crannies between your teeth or along the gumline. Since sugar can lodge there, it doesn’t get washed away like it does in the visible spots. And the longer it stays in place, the more time the bacteria have to feed on it. So what can you do to keep the sugars from building up on your teeth? Simply brushing your teeth, or even washing your mouth out with water after eating candy, can help, along with flossing at least once per day. But the only certain way is to limit or eliminate eating candy, or other sugary foods, in the first place. Of course, a regular visit to your dentist, along with a good cleaning and exam, can help keep your teeth healthy. To make an appointment with the professionals at Longmeadow, click here.